When we ask nonprofits about their future digital goals they usually have some similar components in their answers… engagement and awareness. Engagement and awareness typically align with increased marketing activity and promotion of your mission and story. Increased engagement online is great, but one thing to consider before diving into a full digital strategy campaign to promote your organization, is the strength of your foundation. The marketing foundation is what you build your digital marketing strategies off of. You need to have a strong marketing foundation in place before your digital campaigns can become successful and help you achieve your organizational goals. 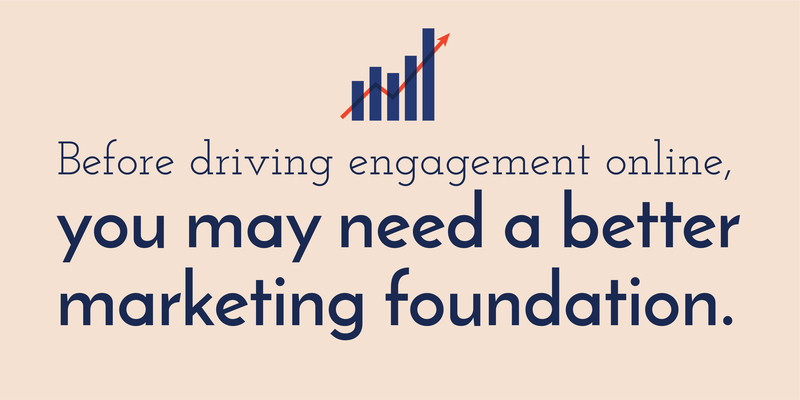 What does a strong digital marketing foundation look like? A mobile-friendly website that includes all relevant information and a contact page. The website also has a CMS (WordPress, Drupal, etc.) and blog type functionality so you can keep add and update content without needing a developer. A strong technical foundation behind the website — resolve things like bugs, outdated plug-ins, speed issues, hacked website, no SSL certificate, etc. Audience persona profiles for each of your key target audiences. A brand guideline document that includes logo files, colors, fonts, brand voice, and key messaging. Google Analytics is installed and your team is using an alias to access all relevant marketing accounts. A basic email template designed within a broadcast email system like HubSpot, MailChimp, or Constant Contact. A clean contact list or spreadsheet that includes your key audiences. Ideally, this is also segmented by audience type, source, etc. Branded social profiles on any relevant platforms for your audience. A baseline of content that could be repurposed or leveraged for marketing such as old blog posts, marketing brochures, or presentations. Now pair this list with what your organization has in place right now. How many of these elements above do you utilize? As a digital agency, these are typically on our hit list when we first engage with a new client. We encourage everyone looking to boost their digital presence to first assess the foundation they are building off. If you need help setting up your marketing strategy or even just choosing your tools, contact ArcStone for a free consultation. ⟵#GivingTuesday is Coming! Are You Ready?